Over the course of 2019, Indian Lake and its surrounding communities are invited to read “Finding True North, A History of One Small Corner of the Adirondacks.” Readers will be welcomed to participate in any of several book discussions the Library will host over several months. 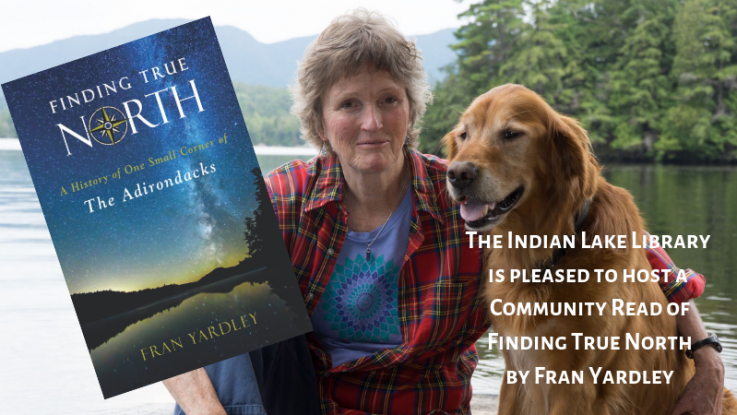 Author Fran Yardley will appear at the Indian Lake Theater Wednesday September 11th to discuss her work and how our own community finds its own sense of place. This project is made possible with the funds from the decentralization program, a regrant program of the New York State Council on the Arts, with the support of Governor Andrew M. Cuomo and the New York State Legislature and administered by the Adirondack Lakes Center for the Arts.